Dog doctors perform tricks to bring laughter into the lives of the elderly. Animal-assisted therapy has recently become a popular topic. It refers to treatment using qualified animals to improve patients’ physical, social, emotional and cognitive conditions. Many illnesses are caused by psychological influences. Animals can help patients relieve stress and relax. Surveys in Britain and Australia have shown that animal-assisted therapy can help patients temporarily forget the pain caused by their illness, assuage their loneliness, and raise their self-confidence. Sister Chen once served as an intern instructor at a nursing home that accommodated mostly elderly people with dementia and mobility problems. Every Monday the nursing home arranged for “doctor dogs” to come. These well-trained dogs would do whatever they could to amuse the elderly, so the seniors were very happy to see them. One such dog was a golden hound named Bubu. Although he was less than a year old, he easily followed his keeper’s instructions, cutely crossing his front legs or pretending to be dead. He also responded readily to the calls of the elderly. When instructed to nuzzle close, he would quietly lie on a senior citizen’s lap so that he or she could stroke his head. His amusing look often had the elderly people bursting into laughter. Encouraged by a nursing assistant, an elder who had been immobilized by a stroke combs the hair of a dog doctor. Buddy was a stray dog with only one good eye, but was adopted and trained as a therapist. Who would have expected that a stray dog would one day become a considerate and lovely dog doctor? He was gentle, obedient, and cooperative in allowing the elderly to comb his hair, which provided them with a chance to exercise their hands, and put on dog collar for him. He also would chase back the balls thrown by the elderly. The keepers said that the therapy dogs always appeared happy on their days of service. When they arrived, they jumped around with excitement, showing infectious happiness and vitality. Sister Chen believed that they were happy because they knew they were about to bring joy and happiness to the elderly people. “Teacher, it was the first time that my client talked so much.” This comment was frequently heard from the nursing assistant students meeting with Sister Chen. Also: “When the dog doctor began its activities, grandma Kaiqi laughed brightly. 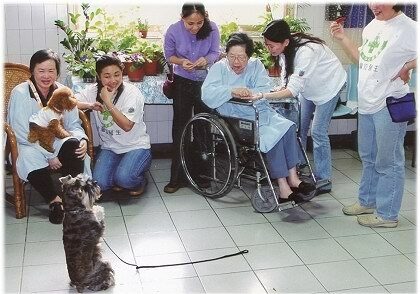 Grandma Kaiqi does not normally talk, but she talked when she saw the dog doctor.” This remark came as a great surprise to Sister Chen, for during the five months that they had known each other, this grandma who suffered from dementia had only laughed loudly but had never spoken a word. During therapy sessions with the dog doctors, however, she not only laughed constantly but also repeated the phrase, “I don’t know.” The nursing assistants identified these as signs of excitement and happiness. They also mentioned that in addition to making the elderly feel good, these activities left those with the “sundown syndrome” (dementia worsening after sunset) in such comfort and peace that they usually slept well without interruption that night. 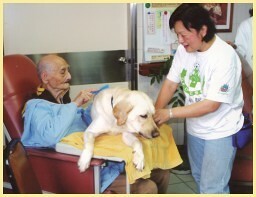 From her experience with the dog doctors, Sister Chen deeply believes that God creates animals to be our good friends. They have high intelligence. Therefore, we should love our animal friends and treat them well so that the Earth becomes a heaven of love.